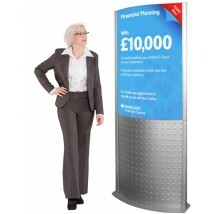 Great value for money floor standing display. We have a wide selection of freestanding sign systems, with many available for fast next day delivery. A range of free standing signs and information poster frames at unbeatable prices. Designed for easy display of signs and posters. If you like these free standing signs, you may also be interested in forecourt pavement signs, free standing a boards and swinging pavement signs.